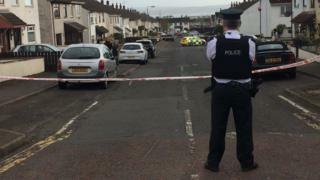 A man who is in a critical condition after being shot in the neck in Carrickfergus, County Antrim has been named locally as George Gilmore. DUP MP Sammy Wilson told the BBC Monday's shooting was part of an ongoing paramilitary feud in the area. The victim is understood to be a high-profile loyalist. Mr Wilson said things had escalated to the point where one side "in broad daylight and unmasked had taken the opportunity to try to kill". There has been an ongoing feud between loyalist factions in Carrickfergus for months, and Mr Wilson said there was a chance of retaliation in the area. "There is no point in me or anyone else appealing to the two sides to back off, the police should make quick arrests and put people behind bars to send out a message that if this continues then people will be caught and they will serve long times in jail," he said. The gun attack happened at Pinewood Avenue in Woodburn on Monday afternoon. The ambulance service received a call at about 14:15 GMT following reports of a man with a gunshot wound, and he was taken to the Royal Victoria Hospital in Belfast. DUP MLA David Hillditch said: "When guns are brought on to the street in broad daylight in a heavily built up area, it only brings home the dangers that are involved in this type of feud. Alliance MLA Stewart Dickson said the attack had "cast a shadow" over the area. "Any attack of this nature where a weapon is discharged is incredibly scary for the community," he said. "Who knows what the risks are - obviously an individual has been seriously injured, but on top of that there there are people living in houses locally, there are schools and businesses in the area that are vulnerable to this type of attack. The shooting came after a serious assault on a door man at a nearby bar on Sunday. Two brothers and another man from Carrickfergus appeared at Belfast Magistrates' Court on Monday charged with attempted murder.